Called ‘A Celebration of Caravanning’, Jo has designed the 10m x 10m garden for The Caravan Club and it’ll be featuring a fabulous vintage caravan called Doris. The idea behind the garden is to highlight the joys, flexibility and freedom that a touring holiday in the UK can offer. But Jo’s design also shows you how a caravan would make a wonderful addition to your garden too! Everything seems to be coming along smoothly with the man-made items for the garden. The hammock being created by textile designer Carmel Meade is looking gorgeous as you can see from the image below. Jo’s very fond of seating in her gardens, so she’s designed some benches for the show garden which appear to float, by means of polished steel frames underneath them. They’re being made by Auspicious Furniture in Gloucestershire. Jo wanted a vertical structure in the garden apart from the trees, so she’s included some wooden pillars in the design, which you can see in the image at the start of the blog post. 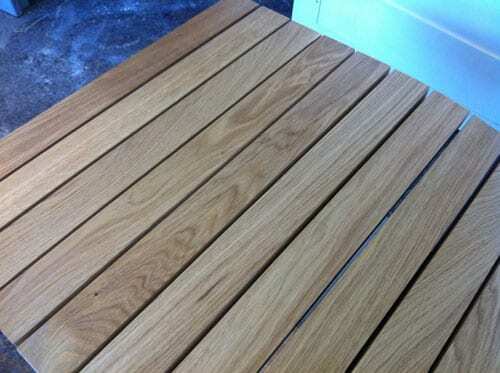 Originally, they were going to be driftwood, but now they’re going to be made of the same oak as the benches. And in theory, you could grow climbers up them. The rills, which you could describe as small brooks, are being created by Simon Percival, who specialises in water features. 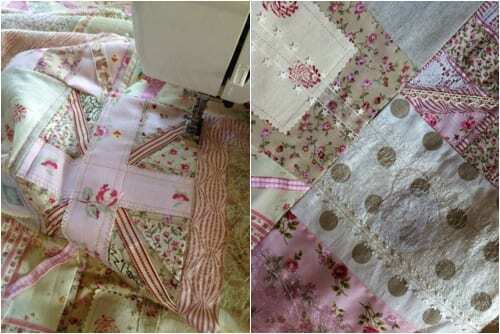 They will cut straight across the garden and will echo the same ‘quilted’ detail which can be seen on the outside of Doris. Last month, I had meetings with Jo and Laura Ashley in the same week and it suddenly occurred to me that there was some synergy between the style of Jo’s garden and the Laura Ashley brand. So, to cut a long story short, Laura Ashley have very kindly agreed to provide some of their beautiful vintage-inspired products to style Doris, including tea towels and a cake stand. 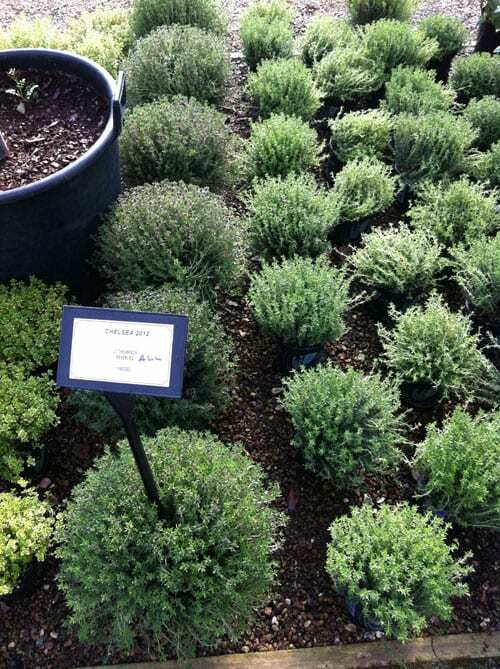 Jo has recently visited Roger Platts nursery at Edenbridge in Kent, where the majority of the plants are being grown. She said: “The flexibility of the plant list has certainly been useful in the last week or so. Plants that should have been fine seem to have caught a bit of a cold over the winter and are not doing what they are supposed to do, whilst others look set to out-perform even our highest expectations. Roger is such a pro and having had a lot of experience of growing plants for Chelsea, he has plenty of substitutes and back-ups. Sue Marshall and her team at Iris of Sissinghurst are also involved in growing irises for Jo’s garden. The plan is to include Iris ‘Ever After’ and Iris ‘Success Fou’ which are pictured below. A new addition to the scheme are twelve big myrtle bushes. 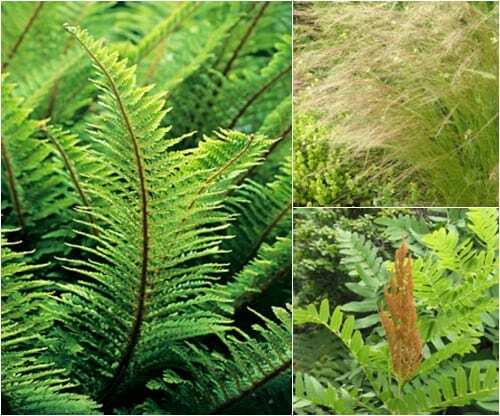 Polystichum setiferum Plumosodivisilobum, Stipa tenuissima & Osmunda regalis below are also being used in the design. I’ve recently spoken to Jim Hillier at Hillier Nurseries to discover more about the five Betula albosinensis ‘Fascination’ trees which Jo will be using in her show garden. In particular, I wanted to find out about the logistics of getting them to Chelsea. 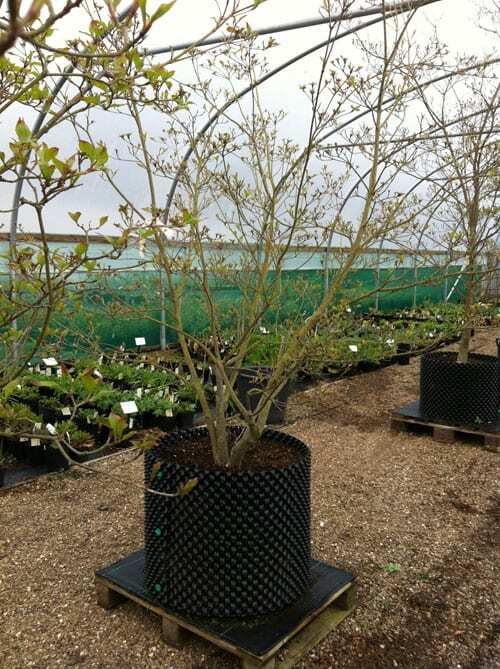 Jim said: “By next month, when it’s time to take the trees to the show, they’ll be in leaf, which creates a few challenges for transporting them as the leaves can deteriorate. They may become dry or wind-damaged. So to protect them as much as we can, we’ll tie in all the branches. Then, as each tree weighs about half a tonne and is about 20ft/6-7m high, we’ll use a telehandler, which is like a big forklift truck, to lift and place them horizontally on to the back of a big articulated lorry. Every precaution is taken to ensure that the bark isn’t rubbed and branches aren’t broken. Once loaded they’ll be covered so that they don’t get damaged in transit. The lorry will then make its way up the M3 from Romsey in Hampshire to Chelsea. As there are only certain times that articulated vehicles are allowed into the show ground, we’ll be co-ordinating with Jo as to when we can come on site. Generally, it’s ten days to two weeks before the show starts. I asked Jim how the trees coped with being dug up and moved around. He said: “These are specially prepared nursery trees. They have been growing for eighteen years and for their whole life, they’ve been used to being moved. Because Jo’s garden will be on Main Avenue in the showground, she said: “The logistics are extraordinary. There’s no room to store anything. So, when 1,500 plants arrive on site on Saturday, 12th May, we’ve got to know where quite a lot of them are going straightaway. Jo and Carmel were on BBC South East this month talking about the show garden and hammock. Filming for BBC Gardener’s World took place on Tuesday this week and Jo will be involved in an RHS video diary too. Jo was interview on the Sunday Gardening programme on Radio Kent last Sunday. If you’d like to listen to it, it starts at 1:14:50 into the programme. As well as co-ordinating everything for her Chelsea garden, Jo has also been working on lots of other commissions for her garden design business. She currently has projects and private gardens on the go in London, Kent and Sussex and these are now being left in the capable hands of her team of five, so that she can concentrate fully on her Chelsea show garden. She doesn’t have a spare day now until after the show…and that has been the case for the last couple of weeks or so. Jo will be on site at the RHS Chelsea Flower Show from Thursday, 3rd May. 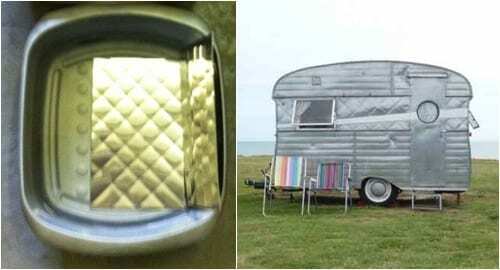 She then has eighteen days to turn a piece of green turf into a haven of vintage tranquillity for the adorable Doris the caravan who’ll be gracing the garden with her presence from Monday, 7th May. Landscape contractor, David Dodd and his team at The Outdoor Room will be building the garden with Jo. 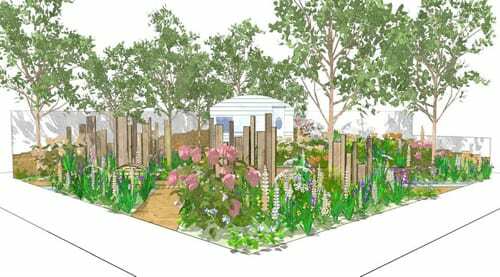 They’ll be assisted throughout the build by Jo’s translator Yuko from the Gardening World Cup 2011 in Japan, who is also a garden designer. And for the last few days of planting, they’ll be joined by her contractor Taka Nakamura, who built the garden at Huis Ten Bosch in Nagasaki. He’s also flying over two of his employees to help. I’d like to wish Jo and her team all the very best for this final run up to the show. I’m so looking forward to seeing the final design in situ on Main Avenue next month. P.S. Here are links to Part 1 and Part 2 if you’d like to read more about Jo’s garden.